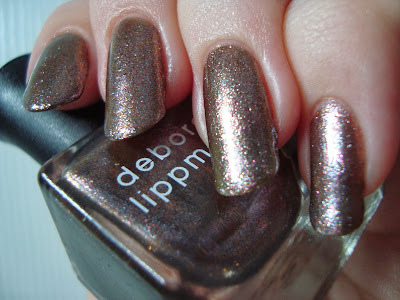 I don't buy "high-end" polish very often, since I try to keep my price-per-bottle low. 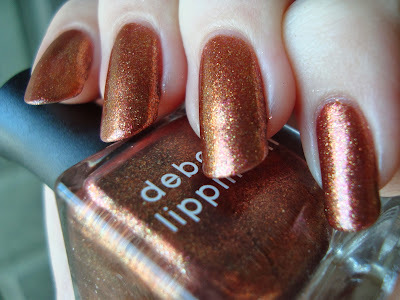 When I went to tag this post, I realized we didn't even have a tag for Deborah Lippmann yet. 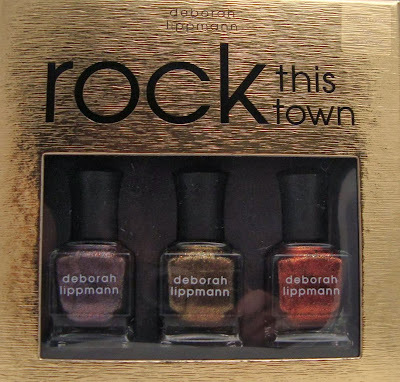 I bought this trio of polishes from Gilt (out of stock right now) for $15 on Black Friday thanks to a tip from friend/longtime reader Karen. The original price is an eye-watering $42. Yipe! I think that's less than Lippmann's regular price once the math's done, but still...wow. I'd drooled over other people's photos of these three, so when the price was right I pounced. The set's been out for a year, but I figured I'd review them anyway, for anyone who's thinking of giving (or asking for) it for xmas. The formula for all three is about the same. 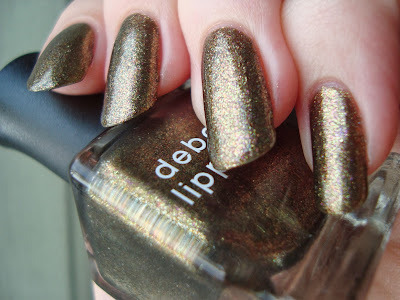 I used three coats for each and wouldn't recommend less than three, even for short nails. They all apply smoothly, though I find the flared caps of Lippmann bottles awkward to hold. Moon Dance is a complex blend of gray, pink, copper, and lilac microfleck. It's intricate and fascinating, with a stunning glow....but it's dismayingly familiar. I fell in love with something a lot like it last year. OPI The World Is Not Enough looks pretty much just like it. ...with a subtle exception. The pink flecks in The World Is Not Enough shift fairly strongly to green at extreme angles. Moon Dance's pink flecks have a hint of shift, but not like the ones in TWINE. 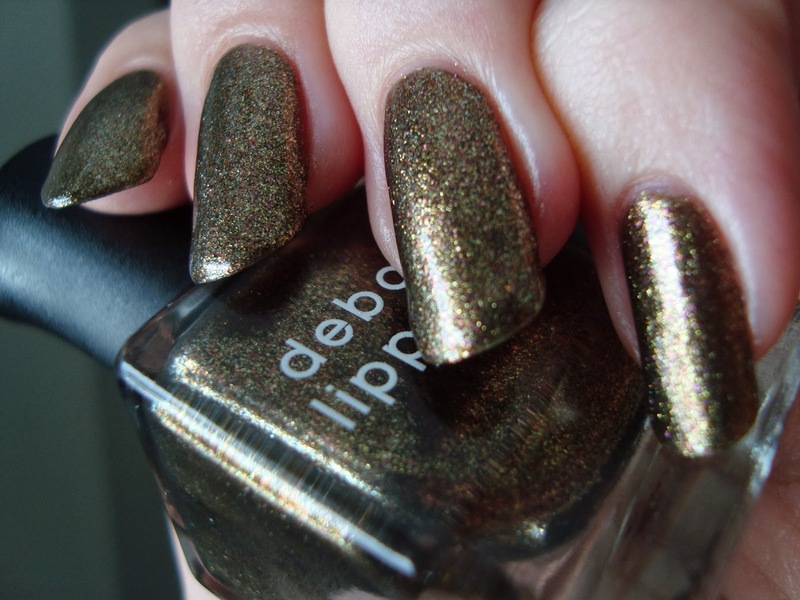 Chain Reaction blends dark gold, olive green, and copper microfleck. This is the most unusual of the three, and my obvious favorite. Me and these damn greens, right Nichole? It's not as complex as Moon Dance, but I wasn't hit over the head with that familiarity feeling. 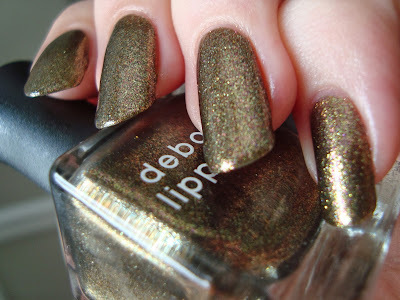 It reminds me a bit of LA Colors Cactus, but doesn't have a cobalt base or any blue flecks. Blue flecks also separate it from Nicole by OPI For Gold Time's Sake, which has pink to it too. I think I can safely say I don't have a dupe for Chain Reaction, even if I do have a couple of sisters for it. 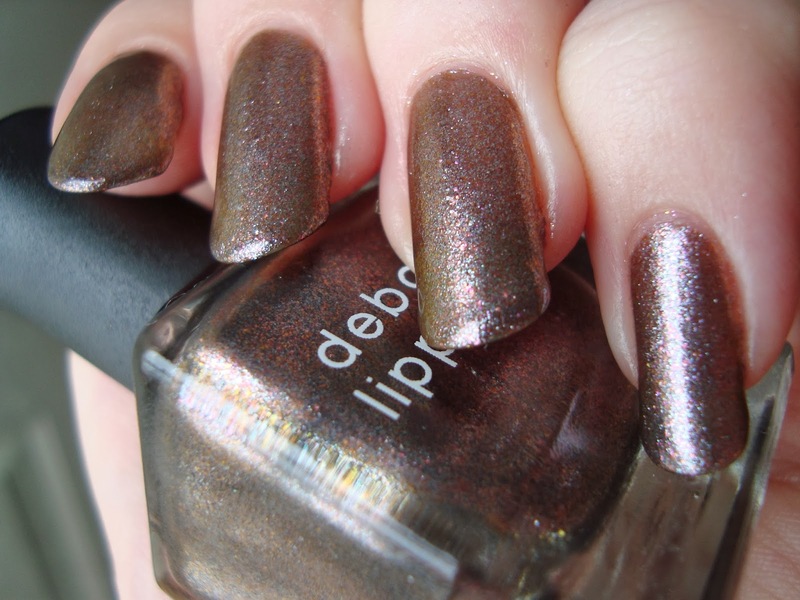 It's a really interesting color/finish combo and I don't mind having a few different variations on its theme. 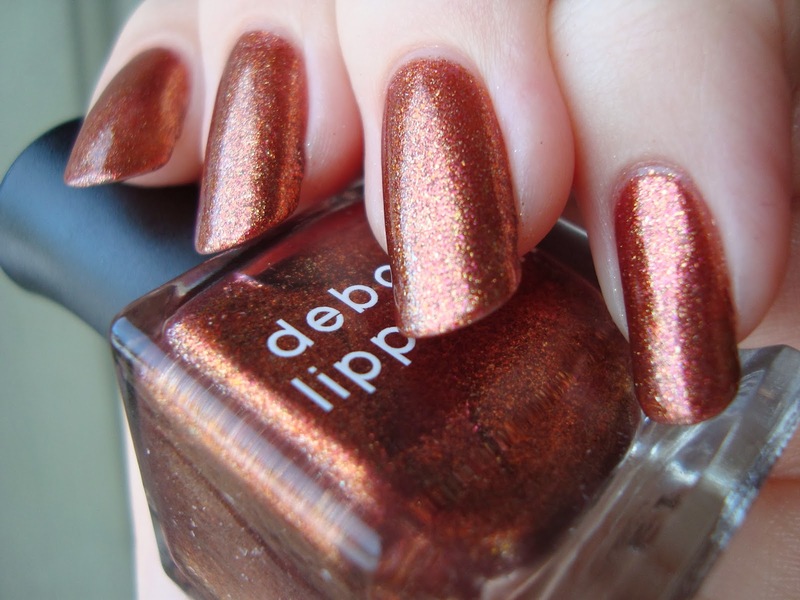 Phoenix Rising has coppery orange flecks with dashes of red and gold. I wore Phoenix Rising first, as a full mani for a night of xmas shopping with my partner. It's gorgeous, glowy, and festive...but again....familar. I felt like I already had it. I had to check my spreadsheet, since I have a bunch of coppers, but there it was. 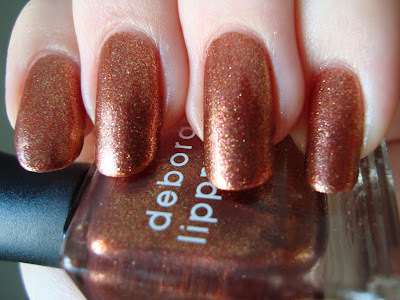 OPI Sprung. Dammit. They're pretty much identical. Bottom line: I feel like I could have been smarter about this purchase. After doing my comparisons, I googled around and found other comparisons from when it was released. Same conclusions. The bad part is I'd read these reviews back then. 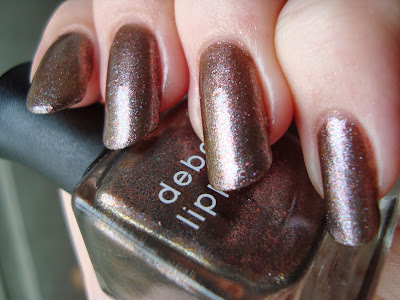 Phoenix Rising is a dead-ringer for OPI Sprung and Moon Dance is essentially a "dud" version of OPI The World Is Not Enough because it doesn't have that green flash. Chain Reaction is awesome, but I feel like I paid $15 just for it...which I consider to be way too much. The other two might wind up in my blog sale next time I update it (soon-ish). I'd only recommend this set if you're so smitten with Chain Reaction that none of its "sisters" scratch your itch for it. 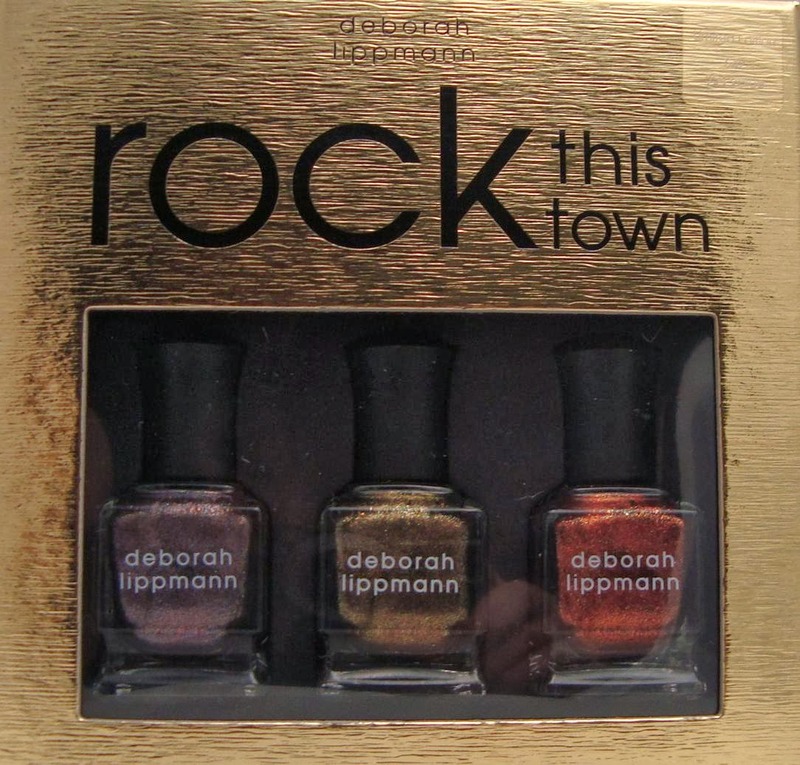 If you're a diehard Lippmann fan you've probably had it for a year. It would be a decent gift, but the full price is very steep considering the dupes and near-dupes. It makes me wonder who technically duped who. I can't really say, since they all came out within weeks of each other last year. 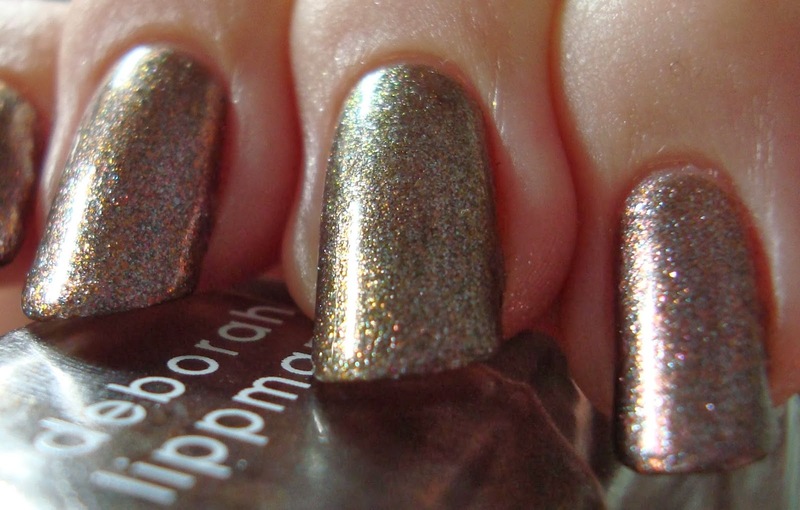 I do know that OPI's shades are chosen and revealed months in advance, but I'm not sure what the timing's like for Lippmann. Maybe something was just in the air last year. Who knows?